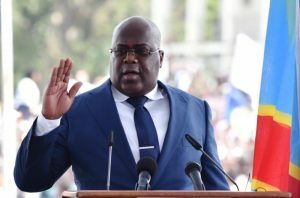 KINSHASA, Congo (CNS) — Some Catholic bishops from Congo have endorsed the disputed election of Felix Tshisekedi as president, despite continuing criticisms from other church leaders. The eight-member provincial episcopal assembly of Kananga, covering Congo’s troubled Grand Kasai region, said the election of Tshisekedi, who is from the region, was the “crowning moment of a long political fight” for “democracy and social progress for all,” based on respect for basic rights, good governance, free opinion and the defense of cultural values. The United Nations reports 4.5 million Congolese are displaced and a fifth of the mineral-rich country’s population needs basic assistance. Although war officially ended in 2003, at least 70 armed groups are believed to be operating in Congo’s mineral-rich eastern areas, including Grand Kasai. The message was published as Tshisekedi announced his first appointments after taking office Jan. 24 as the DRC’s fifth president. However, Tshisekedi’s principal challenger, Martin Fayulu, continued to urge civil disobedience after losing a Supreme Court appeal Jan. 20 against the declared election results. In a Jan. 11 video briefing for the U.N. Security Council, Archbishop Marcel Utembi Tapa of Kisangani, president of Congo’s national bishops’ conference, said the Catholic Church had deployed almost 40,000 accredited observers during the Dec. 30 elections, and results published Jan. 10 by the nation’s electoral commission did not “correspond with data” collected by the church. In a Jan. 25 statement, the bishops’ conference said Archbishop Utembi had been too busy with pastoral duties to attend Tshisekedi’s inauguration but denied media claims of a church boycott and said the conference’s deputy secretary-general, Father Georges Kalenga, had attended instead. The Kananga bishops said they believed Tshisekedi’s leadership offered a chance of infrastructural development and environmental protection, as well as advancement in agriculture and industry, and greater professionalism in the police and security services, education and health care. They added that thousands of young people had already converged in Kananga to hand in weapons, and the bishops said they relied on Grand Kasai’s newly elected representatives to address the poor governance that had long fueled frustration and violence. “We all desire a new Congo, where it will be a blessing to born, to live and to die, and this new Congo won’t be a miracle but the work of all of us,” the provincial bishops said.